The Gorilla grips are popular in telecom stores. If a telco understands the benefit of Gripzo security brackets for smartphones and tablets they are deployed on a large scale. The Mechanical anti theft grips are ideal for telco stores as they are a deterrent for shoplifters and if they do try to steal out of the grips they get no chance. For retailers the mechanical grips mean, ease of mind, as they are very robust and stop theft. The quick release option to demo a mobile device is a big bonus for retailers as that improves interaction and sales. High risk stores are often the first to deploy mechanical security fixtures for smartphones and once they are in the store staff really start to appreciate the ease of operation. Adjustable grips keep the bracket suited for all smartphone brands and models. Staff can change devices themselves all they need is an Allen key of 3mm and of course the security key. Store staff love the lack of cables, sensors, electronic keys, self-adhesives because this all means no more hassle and no more false alarms with Gripzo. This frees up time to focus on sales and that job is easier with Gripzo security clamps because if a customer wants to hold a device they will ask someone from staff to open the grip and hold the device. Staff will have valuable time with this obviously interested customer, which results in a better store conversion. 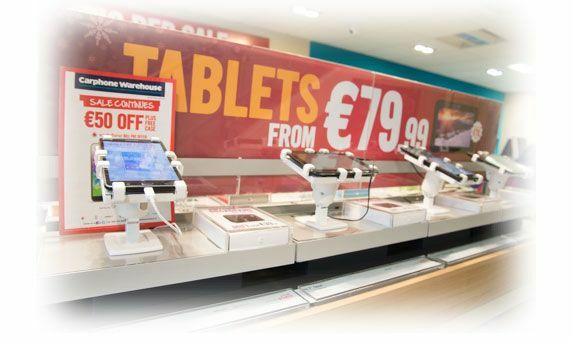 Tablets are more and more used for point of sale these days. Logical, because a big number of payment apps are available and make life a lot easier for any retail business. What is often forgotten is to think of a security fixture for tablets. Tablets in any public or semi-public environment needs a solid protection against theft, otherwise they will be gone in less than a day! 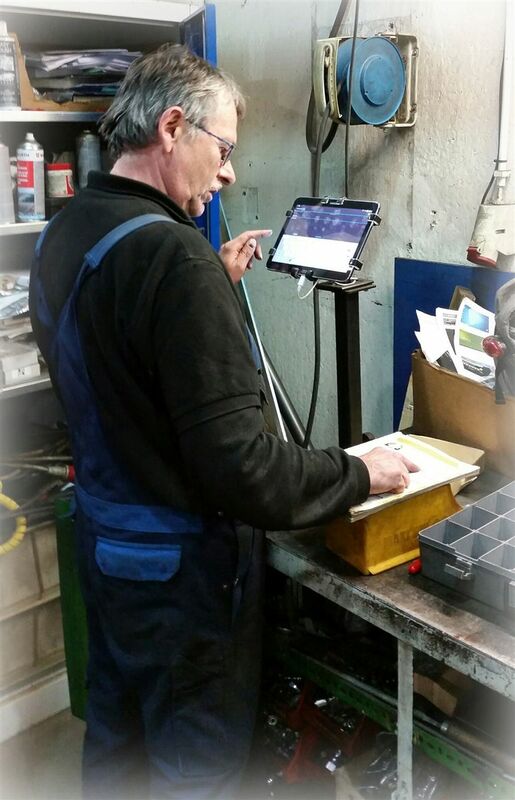 Gripzo security mounts prevent illegal removal of tablets. The tablet mounts are installed with screws or bolds. The tablet fixture can be mounted horizontally or vertically (wall mount). That’s easy as tablets are often used for assisted sales tasks in a store to present videos on products or provide stock information or as an ordering system. Gripzo has developed special XL security mounts for tablets to accommodate the larger iPad Pro and Samsung Galaxy Tab 12.2. Tablets are often used for hospitality for example to show a welcome video, sign in, register, floor plans and many other applications. Gripzo offers iPad kiosks and iPad enclosures for hospitality whereby the main advantage is that the tablets are quickly locked but also quickly released in case of need with an authorised key. The open structure of the Gripzo security kiosk is an advantage as Wifi or 3G and 4G and Bluetooth signals will get through to the tablet whilst in the grip. This is important as in 99% of the cases the tablet needs to be in online with a server. 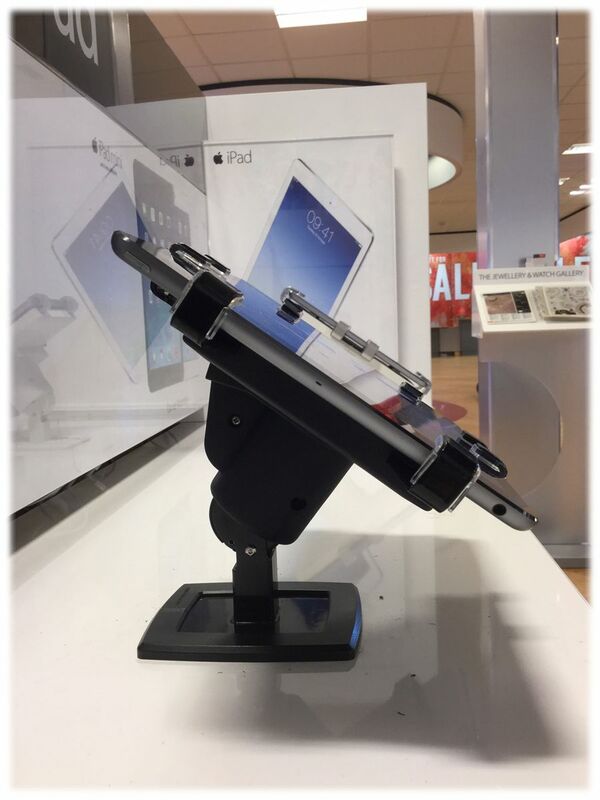 Retailers such as hypermarkets and supermarkets who sell electronics can benefit tremendously from the Gripzo mechanical security brackets for smartphones and tablets. Having expensive mobile devices on display gives an opportunity to shoplifters. With the forged steel side grippers holding the mobile devices the shoplifters will get no chance to steal. If a customer is interested in a certain device they can call shop staff and ask to open the Gripzo grip to hold a device. This option of the Gripzo grip stimulates interaction and improves sales. Mounting the security fixtures is done with security screws or nuts and studs, this way the risk for illegal removal is kept to a minimum. In case the supermarket or hypermarket has a product change, the grips can be adjusted easily by store staff to fit the new devices. This way the grips remain to serve their purpose to the electronic retailer. Because the Gorilla grips of Gripzo do not use electronic, sensors and adhesives no false alarms are generated and results in a quiet store which provides a better atmosphere to buy a new device! Tablets are often used at trade shows and exhibitions, which is logical because they are mobile, but what if you need to go to the toilet or want to have a break? You don ’t always want to carry the tablets with you for safekeeping. In those cases Gripzo security holders and iPad kiosks are easy to use. Simply lock and dock your tablet if you don’t need it. If you want it you can open the grip with your own key and get the tablet out in 3 seconds. You can choose between tablet mounted security fixtures or tablet kiosks on a pole which can free stand on your booth. Offices are often semi-public buildings where most people can wander about unseen. Offices are also typical environments where lots of expensive equipment is used like PC’s, laptop or tablets. Typically tablets are often put down at desks if the owners need to go to a meeting or toilet, these are moments theft can occur. With Gripzo fixture fixed to desks or somewhere at the office space you can lock and dock your tablet if you don’t need it. Theft prevention at offices should be done but isn’t done as often it is necessary. Theft at offices is a big problem worldwide.